When we looked at this property to consider purchasing the place, there was a shell of a hoophouse on it. After moving here Homer cleared all sorts of things out of it: full grown trees, tons of trash, bird cages, bird stands and the like. This property used to be Woody's Bird Farm and they used the hoophouse for bird housing. Several times a guy pulled into our parking lot, offering to buy the hoophouse. For thousands of dollars. We turned him down each time, then decided we needed to learn more. 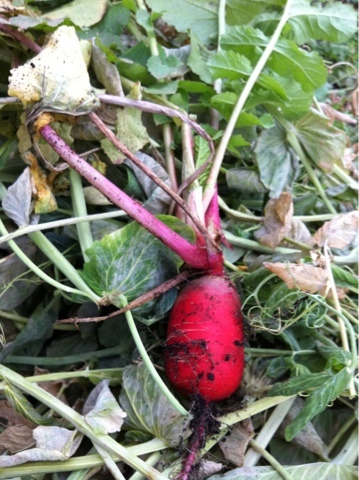 We spoke to vegetable growers, read books, attended conference sessions on winter growing. It is a funny thing about seasonal growing. If seeds don't get planted at the right time, in the right place, you have nothing to eat. Under the hoophouse it is advised by all the experts that planting of cool weather crops occurs in late summer..August and September..so that the plants germinate and have good growth before real cold sets in. One problem. We planted tons of stuff. Or so we thought. Then the kale, collards and Swiss chard turned out to taste amazing. The exposure to cool temperatures sweetens them, and we and many of our customers have eaten them every day. Now our hoophouse has been picked clean. There are beds of lettuce still, also delicious, but the greens are really amazing. 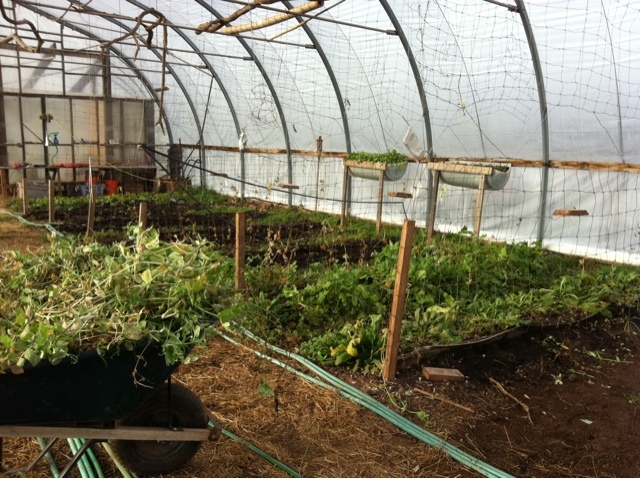 In the last few weeks Homer removed all the pea plants, lots of radishes, and planted more greens. Our fingers are crossed that they will germinate and grow in the coldest winter months of the year..it seems easier to make it through this time of year with a plate full of fresh cooked dark greens every day! Grow little seeds grow!